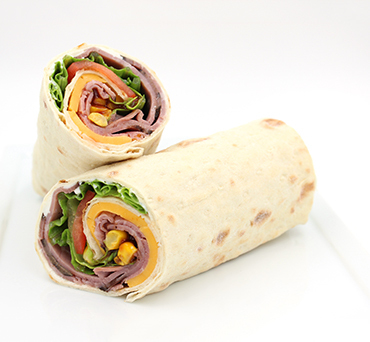 Place cheddar and roast beef on bottom half of Lavash. Add lettuce and tomatoes on top of roast beef. Sprinkle corn and drizzle BBQ sauce on bottom half of Lavash. Roll tightly, starting the first fold right away at the edge for the best pinwheel spiral!